I am thankful for so much! I truly feel like one of the luckiest people on the planet to have my friends and family, our pets, our health, the roof over our heads, and the food on our table. As this is a knitting blog, I also want to say how especially grateful I am for the craft of knitting, for yarn, and last, but not least!! !, for my circle of knitting friends. They fill me with admiration, and keep me laughing...a damn fine combination to have in friends! When I am filled with gratitude, I like to give back a little something. So, during this Thanksgiving week, I am devoting all my knitting time to work on a scarf for the Red Scarf Project 2009. I started writing a note about the Red Scarf Project days ago, but never finished, so it didn't get posted. Then I saw this blog entry by Norma, who has taken on the role of official cheerleader for the Project. She writes that the scarf donations seem to be falling short of their goal this year, so I feel it is even more important to get the word out about this program. 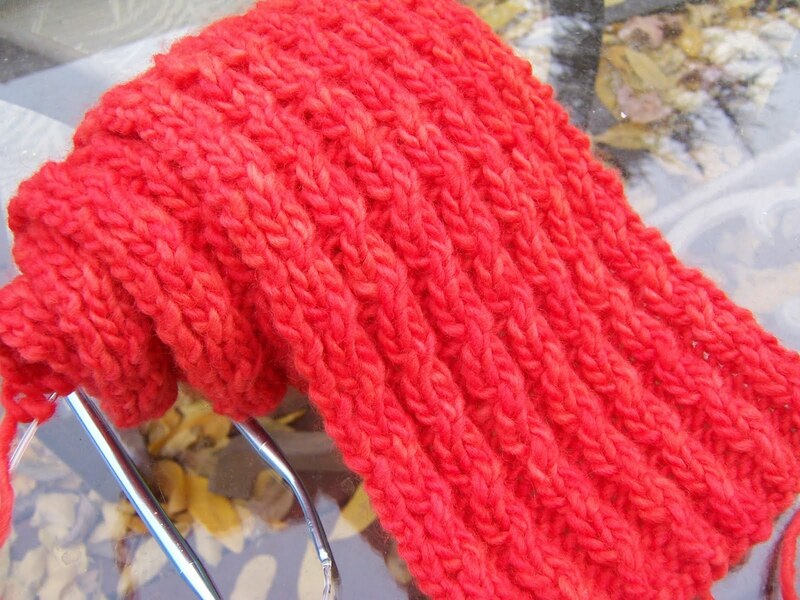 It was created by the Orphan Foundation of America to include hand-knit scarves in Valentine's Day care packages for college bound foster youth. It is one of the patterns that Imagiknit gives away with a yarn purchase at Stitches, hence it's elegant name: "Shop Sample Pattern #32". I thought it would take a long time to knit, but on size 10 circular needles in Malabrigo, I am about half-way done after just a few days. I just might have to knit more than one. I hope you all are having a wonderful holiday. What a nice post Shannon. I feel the same way and do feel very fortunate for my family, friends, and health. I'm also very thankful that I have a great stash and can join you in knitting a red scarf for the project! Yes, I too will now start another project even when I have so many UFOs. Oh well I'm lucky enough to have the encouragement of a wonderful friend!